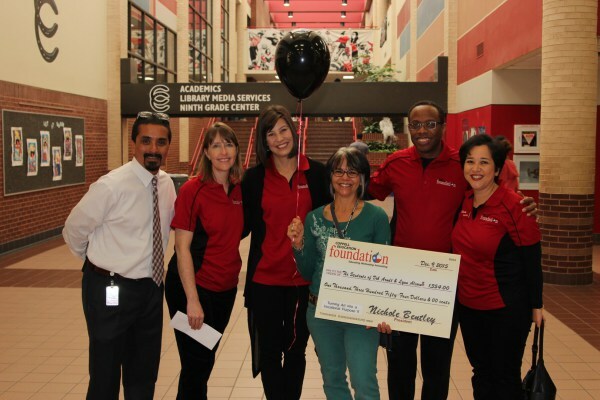 Coppell High School's Deb Arndt and Lynn Alcorn received $1,354 for "Turning Art into a Vocational Purpose II." This funded supplies for the Practical Academics classrooms, Recycling Club, and Applied Art classes to create and design cards to sell as a hands-on vocational activity to support their Recycling Club. This was a continuation of a previous year's grant, which was successfully implemented by the students. The students reinvest profits back into materials needed for ongoing production. They also make group decisions such as purchasing t-shirts to wear when recycling or working in the school cafeteria. The vocational skills involve marketing their product, customer service of taking orders, tracking inventory, packaging the product, money management, calculation, design of the product and production.